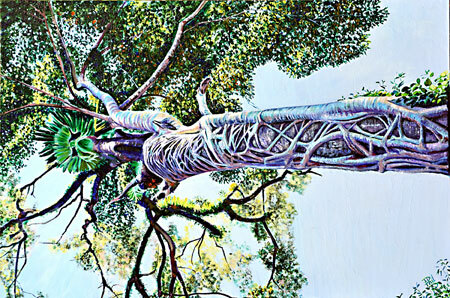 or by appointment phone (02) 61612177 Featuring Canberra ceramic artist Monika Leone and regular exhibitions by some of Australia's most talented artists. 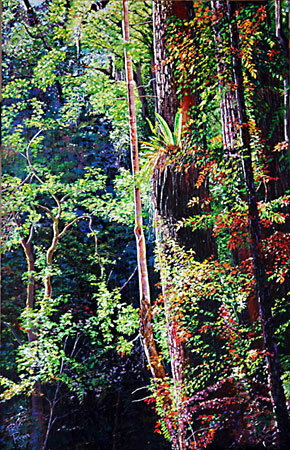 Featuring aspects of sub-tropical, warm temperate, cool temperate and littoral rainforests of mainly northern NSW. 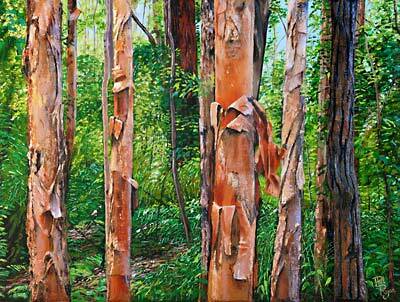 Acrylics and mixed media all beautifully framed in native Australian wood. 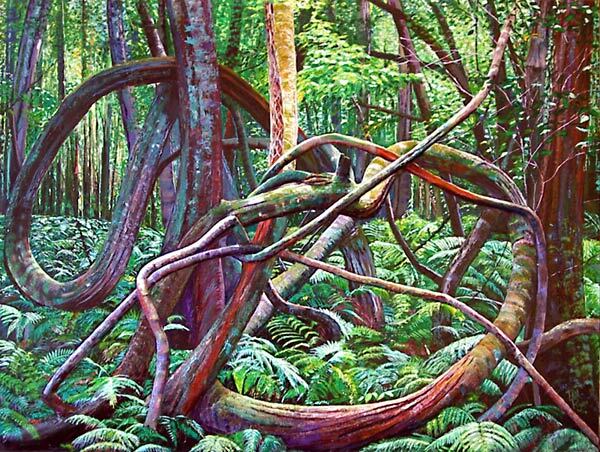 While national parks have saved what little is left of our rainforests, research scientist turned professional artist Phil Ryan now wants to bring them into their rightful place in Australia’s art world. 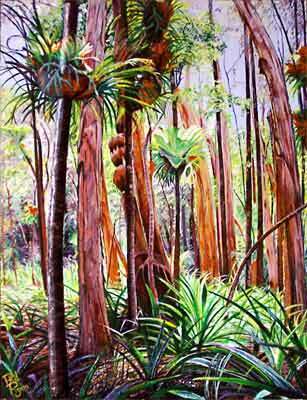 His latest exhibition of distinctive paintings called " Rainforests – Art’s Forgotten Landscape" on show at Mawson Gallery features scenes from a number of NSW's diverse range of rainforests - from sub-tropical, warm temperate, cool temperate, and littoral rainforests of mainly northern NSW. 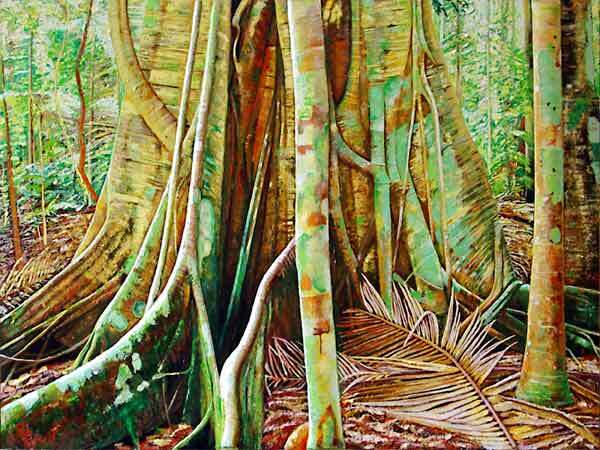 The exhibition will be opened by Professor Peter Kanowski, Professor of Forestry at the Australian National University on Wednesday, 8th April. 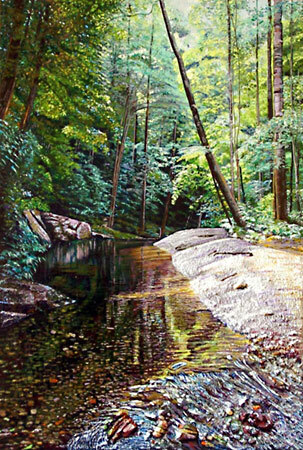 Phil, a former Canberran, became a full time painter in 2005 after more than 25 years as a scientist with Forests NSW and CSIRO Forestry and Forest Products. 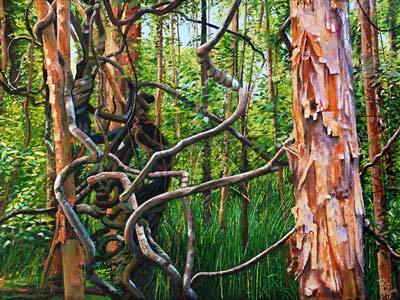 He now works from a studio in the old Kunama Public School house south of Batlow. 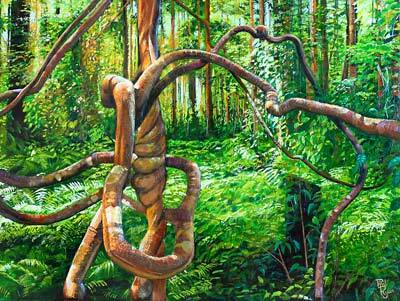 "Our rainforests just do not figure large in Australian art” says Phil. 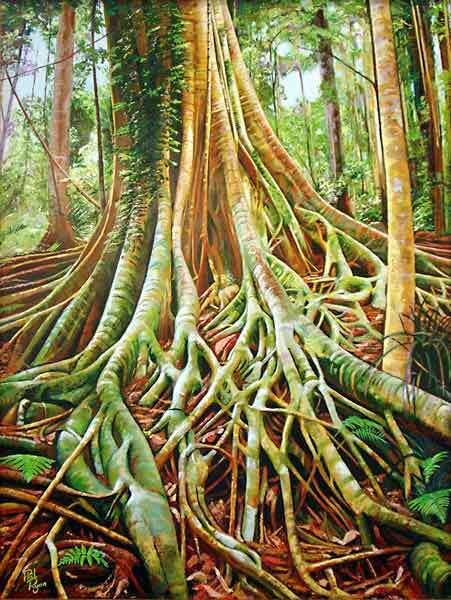 “It’s true that some of the early colonial paintings depicted the wet forests of Victoria, but compared to the impressionists’ delight in old stately eucalypts and pastoral scenes, rainforests have not inspired Australia's landscape painters. 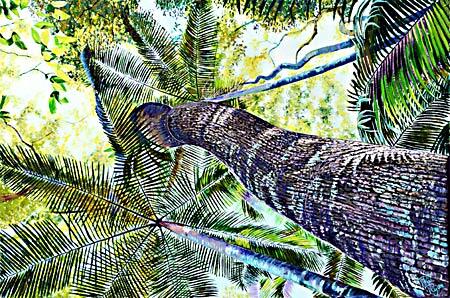 “There are some obvious reasons for this avoidance. 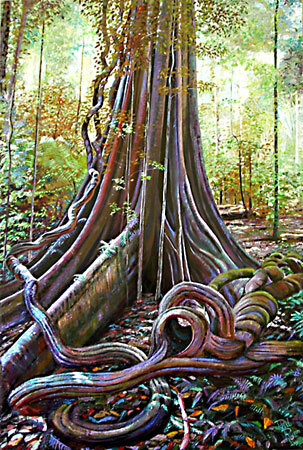 Rainforests are inhospitable places for artists. 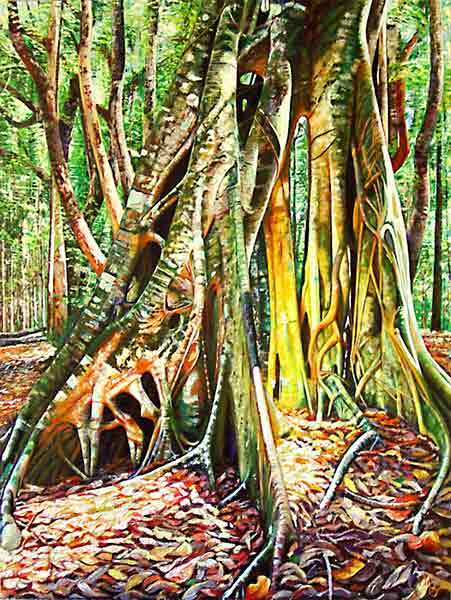 “They are dark, wet and humid with many irritations such as insects, ticks, leeches, stinging trees and lawyer vines that make open air painting inconvenient and impractical at best. 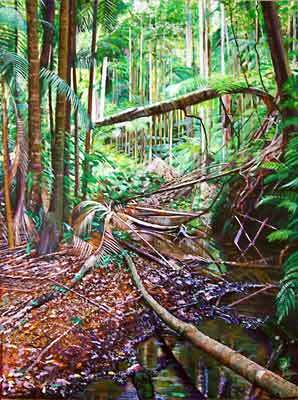 “The sheer amount and diversity of rainforest vegetation means there are few panoramic views where backgrounds are visible except in rare clearings or streams. 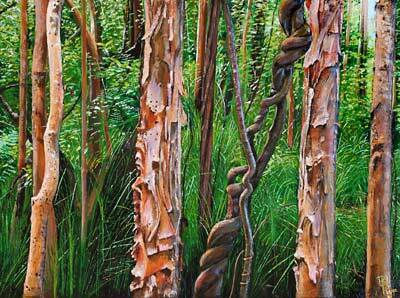 You can only see short distances and there is a lot of foreground ‘noise’ such as vines, ferns and shrubs. 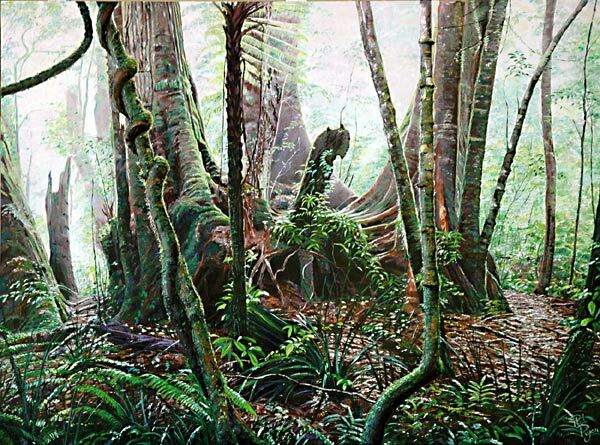 Phil says another reason for neglect of rainforest in Australian landscape art could be their apparent lack of distinctive “Australian” landscape features. 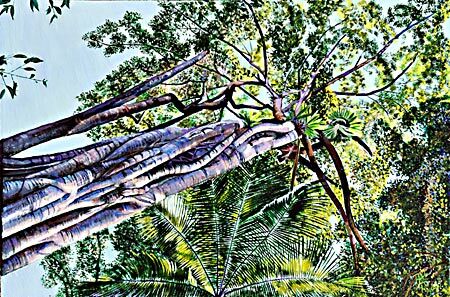 “The nationalistic icons of the gum tree and desert mountain range are instantly identifiable as Australian whether painted by Streeton, Heysen, Namatjira, Nolan or Hart. 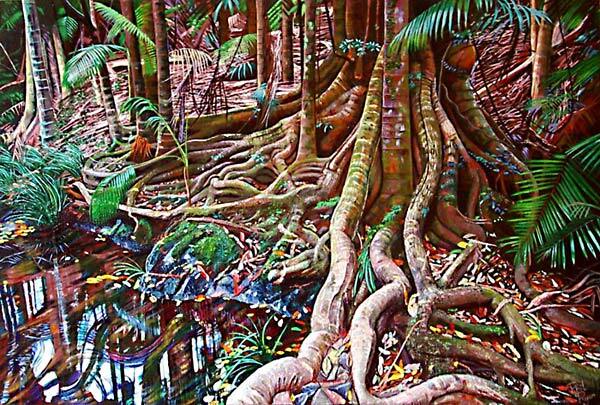 Phil believes there are distinctive Australian rainforest features and he has explored them in this, his third solo show. 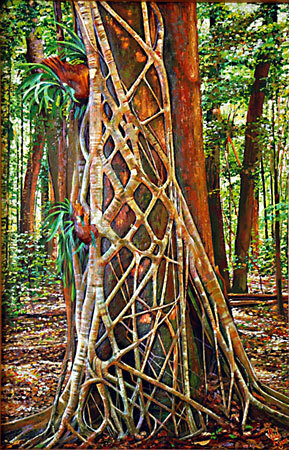 Phil has produced paintings using textural relief and partial 3D sculptural features to enhance perspective and capture various rainforest traits. 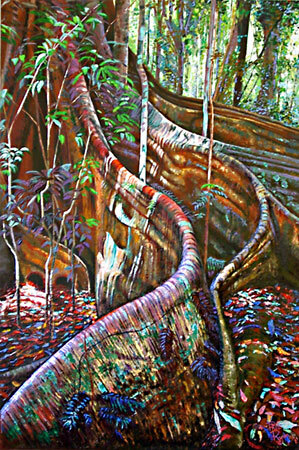 “I wanted to represent some of the unique features of rainforests that strike any visitor to these landscapes - their dense, diverse, multi-layered vegetation all completing for survival. 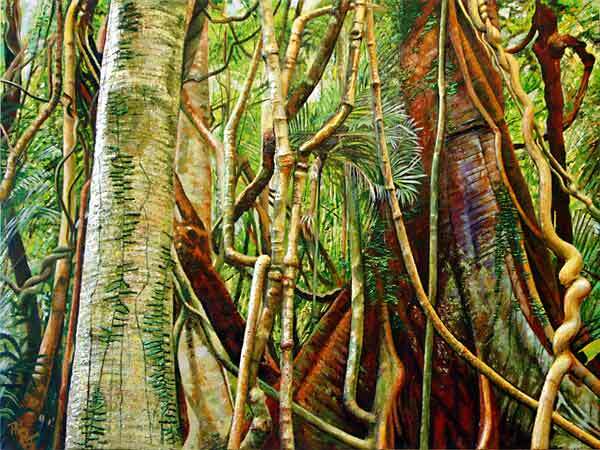 “I wanted to capture the feeling of claustrophobia and ominous resonances you sometimes get in rainforests,” he said. 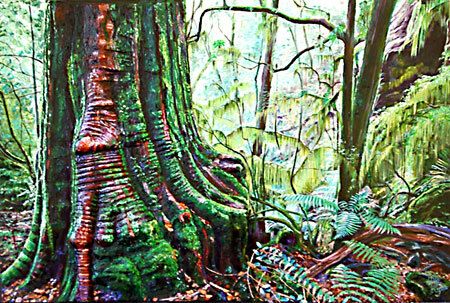 “Rainforests – Art’s Forgotten Landscape” exhibition begins at MAWSON GALLERY, 63 Wilkins Street, Mawson on April 8 and runs until May 3. 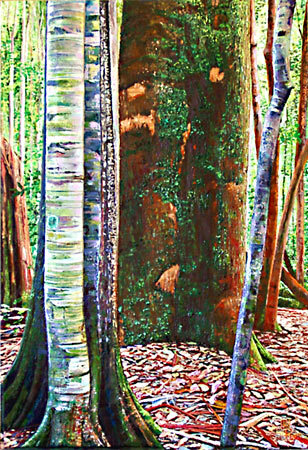 Opening hours are 10.30am – 5.30pm Wednesday to Sunday. Or by appointment anytime. Phone 6161 217.